covers the topic in such a comprehensive manner and in such high quality. 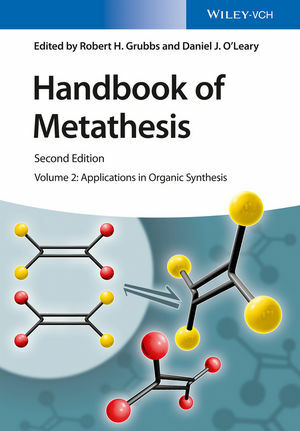 indispensable one-stop reference for chemists in academia and industry. Robert H. Grubbs received his Ph.D. from Columbia University for work with Ron Breslow. After a postdoctoral year with Jim Collman at Stanford University, he joined the faculty at Michigan State University. In 1978, he moved to the California Institute of Technology, where he is now the Victor and Elizabeth Atkins Professor of Chemistry. Among many other awards he received the Nobel Prize in 2005 for his research on the metathesis reaction. His research interests include polymer chemistry, organometallic catalysis, and development of new synthetic organic methodology. Daniel J. O´Leary received his PhD at UCLA in the group of Prof. Frank A. L. Anet. Following an NSF postdoctoral fellowship with Prof. Yoshito Kishi at Harvard University, he became Assistant Professor at Pomona College, where he is presently the Carnegie Professor of Chemistry.His research interests are in the area of organic synthesis, isotope effects, and nuclear magnetic resonance.